Sequential fuel injection is very desirable for engines using big injectors and/or high overlap cams. Cam sync adapters provide a signal to the ECU indicating the intake event, so that fuel is delivered when the intake valve valve is open. These kits include an adapter and sensor. 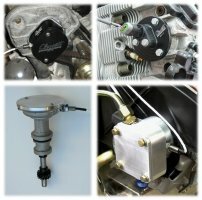 Use this 911 Porsche cam sync adapter for sequential fuel injection with cams having the MFI pump drive boss.